The fantastic Wild Child (seen below in one of the greatest BAMM.tv videos to date) have announced a release party for their new album ‘The Runaround’, taking place at Austin City Limits, TX on October 11. It may seem like a while away, but demand will be high – so grab those tickets now! And if you can’t make it to Austin … make sure to pick up a copy of their new album anyway! ‘Get down, stay down’ may sound like a direct command (imagine your clichéd ‘give me fifty’ drill instructor barking it in your ear) – but such straightforward bludgeoning really isn’t the style of Thao & The Get Down Stay Down, the San Francisco act who just happen to be BAMM.tv’s new Featured Artist. This isn’t to say that there’s no immediacy to their music. Thao Nyugen and her mainstay cohort Adam Thompson (the band members have previous included Frank Stewart and Willis Thompson) have crafted a body of work which – while loosely fitting within umbrella terms like alt-rock and folk-rock – opens up with multiple listens to reveal rewarding intricacies, unique vocal and musical flourishes, and melodies within melodies. You may think you’re getting everything with a surface listen – and an enjoyable surface listen it definitely is – but sentiments like ‘you are a dead man/I just have to shoot the gun’ (‘Body’) and ‘I come back because the punches always hit the same’ (‘Trouble Was For’) show off a beguiling complexity. Think of similar creative multi-taskers like Broken Social Scene, Jim Ward, Cat Power, Fiona Apple and Feist – not a bad line-up to be mentioned alongside – and you’ll be close. Diana Gameros: What Is She Listening To Right Now? 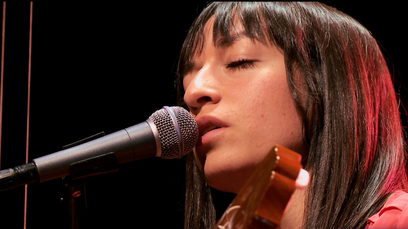 We’re happy to announce that wonderful singer-songwriter Diana Gameros is our Featured Artist. Yesterday we featured an exclusive in-depth article and interview with Diana, and – later this week – we’ve got some amazing giveaways in store (including the chance to see Diana live, and even to spend time with her in the studio!). Avant La Lettre has new tracks coming out next January. Check out their tight performance from earlier this year and then get to know them at http://www.avantlalettre.eu. Introducing Global Scene Live: Amsterdam! Check out Sufis live at BAMM.tv! Musicians, artists, fans, techies, and press filled the BAMM.tv studio this October to experience Sufis, an intoxicating local band. Their sound, described by a BAMM.tv member as 1930’s swing meets Chuck Berry, drove a tantalizing performance. It was like something out of a mad, delectable, roaring, gypsy carnival. With the kegs in place and cameras rolling, Sufis took the stage under a wild cornucopia of string, plumen bulbs, and multicolored ribbons that dipped across the studio ceiling. Lauren, the band’s lead singer, transformed into the queen of the carnival. Her raw, jazzy vocals lit up the crowded room while band mates Jonny, Felix and Ty swept the audience up into their vaulting tide of gypsy rock. Navigating the studio was like trying to cross a listing wooden ship in a storm; hands and feet thrown every which way as the audience moved in tandem with the infectious sway of the band. Loud whistles, clapping, and stomping roared out of the crowd as Sufis’ set drew to a close. You can see Sufis live in San Francisco at The Grant and Green show this Friday (11/9, free admittance) and at their November residency with Amnesia on Tuesdays after 9pm ($5-7). Oh – and if you like the above song, you can download it for free! Check out the new Calahen and Eli album! Remember this post, a few months ago, in which we mentioned that BAMM.tv favorites Calahen Morrison and Eli West (seen above in one of our many exclusive performances, which you can check out more of on our brand new iPad app) were looking for Kickstarter funding for their new album ‘Our Lady Of The Tall Trees’? Well, it looks like several dedicated fans stepped up to the plate – and the album itself is now available to download on CDBaby and iTunes.